When I make perfect 22ct. gold spheres for granulation or perfect circular links for chain mail I feel the breath of the artists who practised their craft before me. Granulation is one of the earliest known decorative techniques in jewellery. It is a kind of magic in which charcoal, glue and a paintbrush are utilised to make highly detailed and complex constructions. A whole day spent working with a few beads of high carat gold might might pass as if only a matter of minutes. Two silver and gold chains made as they have been for thousands of years. I learnt these loop in loop patterns in New York in the year 2000 but the ancient Egyptians new them long ago. Gold granulation spirals ina silver frame. These earrings and brooch are artworks which can be worn. 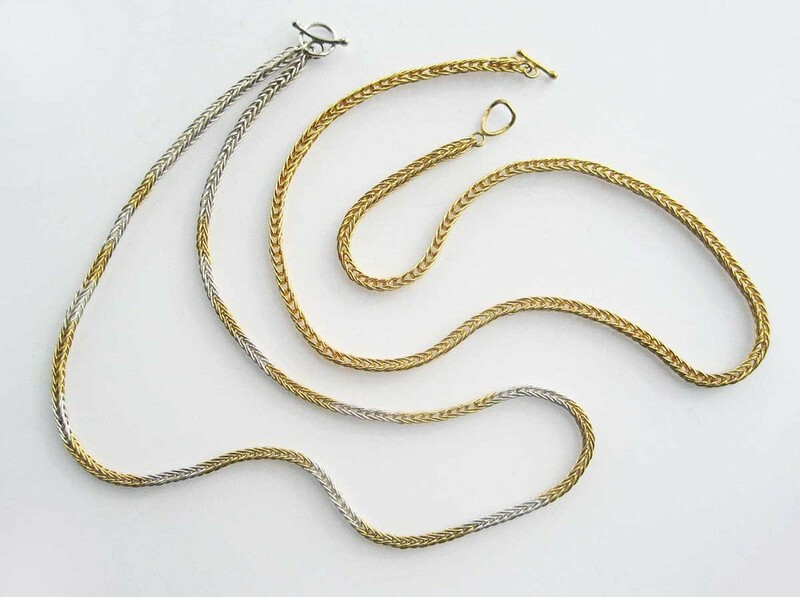 This subtle tapered chain is made of hundreds of gradedsilver beads threaded together. It is a garland of small polished seeds that sit neatly around the base of the neck. Making these gold and silver granulation rings is a challenge. Each small sphere has to be made and positioned one by one with the aid of a paint brush. 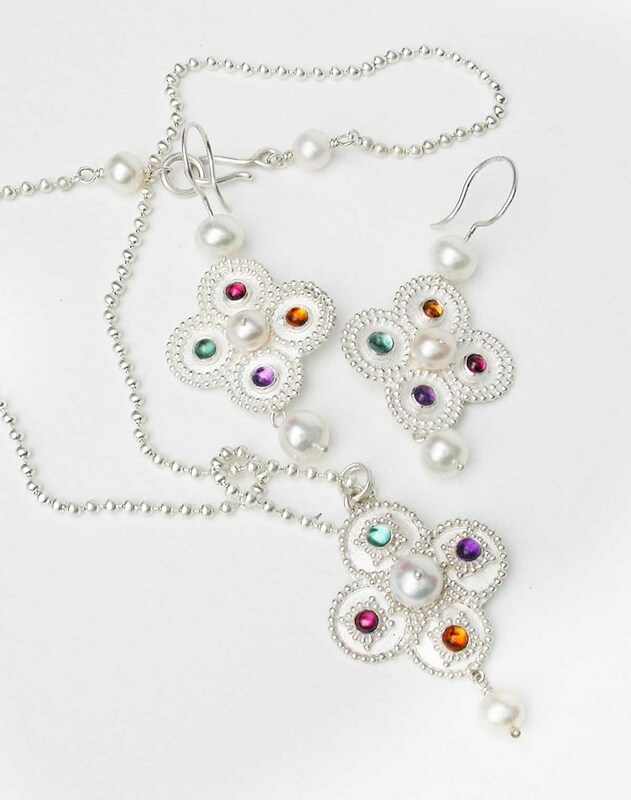 Arichly decorated necklace and matching earrings with silver granulation and coloured stones. This is a heavy silver rope necklace with hook clasp and round chain mail construction. Chain mail designs are found all over the world. Silver granulation rings that sparkle like frost. These chain mail necklaces have become firm favourites over and over again. Here is one in gold and one in silver. One of my favorite, wear every day pieces. What more can I say. It is comfortable, looks great on every occasion and gets me a lot of compliments. Heavy rope necklace with a hook catch.